A GROUP OF independent TDs will meet with dozens of councillors in Tullamore next weekend as plans for the launch of the so-called Independent Alliance are ramped up over the coming weeks. A meeting is scheduled to take place on Saturday, 28 March in the Offaly town with up to 40 councillors expected to attend. The formal launch of the alliance of independent deputies and councillors who may run in the next general election is now expected sometime in April. 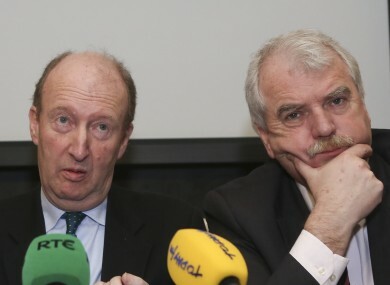 The meeting is being hosted by prominent independent TD Shane Ross along with his fellow Dáil deputies Finian McGrath, Michael Fitzmaurice, John Halligan, and Tom Fleming. Senator Gerard Craughwell is also involved though he will not for election. It has been repeatedly stressed by those involved that the initiative is not a new political party in the same guise as the recently-launched Renua Ireland, headed by Lucinda Creighton. Instead, Ross and others have described it as loose alliance of independent TDs and councillors who will unite on several common principles and policies. The hope is that the alliance could become a major power broker after the next election when it comes to negotiations for government. The common principles and policies are still being worked on, but those involved have repeatedly stressed they have no interest in the strict whip system adopted by political parties. Dáil reform, and tackling mortgage arrears and personal debt will also likely feature as part of its principles. With Ross, McGrath, Fitzmaurice, Halligan and Fleming all expected to contest the next election the hope is that between 20 and 30 candidates can be found to run in constituencies where there is currently no independent TD. It’s hoped that councillors who commanded a strong vote in the local elections last May can be enticed to run under the Independent Alliance banner. Email “Shane Ross (and others) will FINALLY launch the party that's not a party next month ”. Feedback on “Shane Ross (and others) will FINALLY launch the party that's not a party next month ”.